Only Revolutions is a piece of work that will either blow your mind or numb it. Being a highly experimental narrative poem, much of the story relies heavily on tools of wordplay, neologism, and symbolism to carry itself along. This form requires some adjusting on the reader’s part, but after pushing through the first couple of pages it becomes a simple task to adapt to the language. Like the crafty wordsmith that he is, Danielewksi is able to forge beautiful, strong imagery despite the tricky style he takes on. The two narrators, Hailey and Sam, deftly illustrate separate renditions of their chaotic story as 16 year old star-crossed lovers. Understandably, this brief description may come off as clichéd at face value. However, what makes this story so interesting is the wide-ranging view offered to the reader. Plenty of books have already tackled the art of alternating character perspectives in story-telling, but Only Revolutions explores a unique approach. 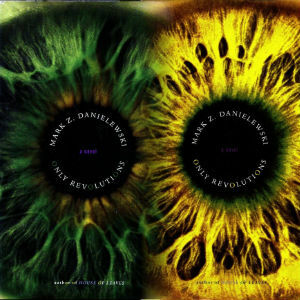 Danielewski grants the reader the rare ability to alternate between the lenses of either character throughout the entirety of the book, allowing both characters to provide distinct, detailed accounts of the same experiences. Thus, the reader is able to piece together the story through he-said/she-said accounts. Sam and Hailey’s journey is a tumultuous one as they defy the passage of time by traveling across the United States in an ever-changing automobile. Proudly, they fight against the conventions of society that threaten to tether them by upholding their nomadic freedom, despite the trials and tribulations they endure. On a surface level, frequent stops throughout the country forces the young couple to constantly reassess how they see themselves, the world, and each other. At a deeper layer, the book is littered with hidden meanings and messages in both the text and physical composition of the novel. The physicality of the book is bizarre, yet fitting in line with the story, in that the two perspectives of Hailey and Sam are written from opposite ends of the book . One character begins at the “front” cover, while the other narrator starts their story at the “back” cover. I use the distinction of “front” and “back” loosely, as the book technically has no end and no beginning. Hailey’s story is written on the first half of a page while Sam’s is written upside down on the bottom half, and vice versa, depending on whose perspective you are reading from. To further illustrate this, if you were to start with Hailey’s story, you would be on page one, which would also be the end of Sam’s story, page 360. Thus either cover of the book could be considered the “front” or the “back”, as the beginning is simultaneously the end. The editor’s recommend alternating between the two perspectives every eight pages, so that each version of the story is read in conjunction. This requires the reader to read eight pages, place their book mark (the book includes two different colored ribbons), and then physically flip the novel over to read the same eight pages of the other character’s take on the story. Many people either love or hate this book, for understandable reasons. The style of the story can be challenging or off-putting to some, as the journey of Sam and Hailey is not straight-forward by any means. Sometimes the wordiness of the character’s narratives can be confusing and muddled at times. However, if the story is not entirely clear from one perspective, the other narrator almost always describes the current wave of the plot in a way that clears up any lack of clarity from the first account. In my opinion this book is more of an artistic, experimental piece, which is another turn off for readers simply looking for a traditional narrative. I highly enjoyed Only Revolutions, but it is definitely not for everyone. Danielewksi is known for writing challenging, experimental work, which makes him an interesting, progressive author that I have been and will continue to keep my eye on.